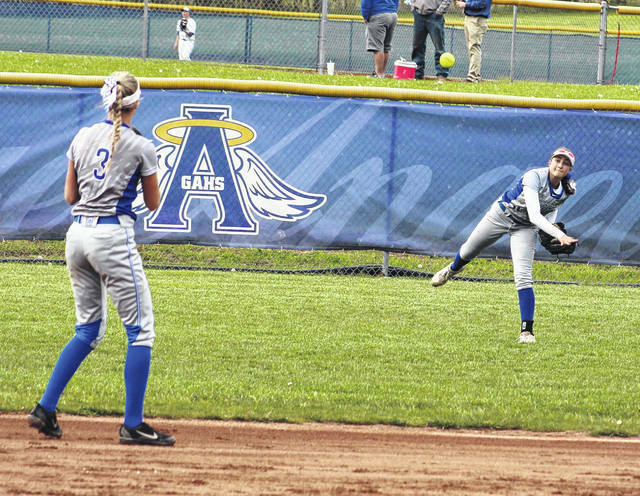 Gallia Academy freshman Bailie Young, right, relays a throw into sophomore Alex Barnes (3) during an April 26 softball game against Coal Grove in Centenary, Ohio. Six athletes from the Ohio Valley Publishing area were named to the Southeast Ohio Division II all-district softball teams for the 2018 season, as voted on by the coaches within the southeast district of the Buckeye State. Gallia Academy led the way locally with four selections, while River Valley also came away with a pair of honorees. Four of the six representatives were also first-time recipients of all-district honors in softball. GAHS freshman outfielder and leadoff hitter Bailie Young was the area’s only first team selection in Division II, while junior pitcher Hunter Copley and freshman catcher Ryelee Sipple were second team honorees. Sophomore Alex Barnes — who joined Copley as a repeat selection — was also named to the honorable mention squad. The Blue Angels finished the season with an 18-6 record and a share of the Ohio Valley Conference championship before falling to Sheridan in the D-2 district semifinals. River Valley — which had zero players on the all-district squad a season ago — posted a 6-10 overall mark this spring, which led to a pair of first-time choices on the D-2 squad. Freshman Sierra Somerville was named to the second team, while sophomore pitcher Airika Barr was chosen to the honorable mention team. Raylene Hammond of Jackson was chosen as the Division II district player of the year. Shane Wolford of Jackson was the Division II coach of the year. Raylene Hammond, Jackson; Taylor Pagan, Sheridan; Kalicia Doles, Waverly; Sarah Moats, Circleville; Shayla Munyan, Fairfield Union; Mariah Ridgeway, Jackson; Darian Radabaugh, Vinton County; Diamond Decker, Warren; Sha Ford, Circleville; Layona Davis; Kaitlyn Davis, New Lexington; Mayci Marshall, Logan Elm; Gracie Casto, Athens; Bailie Young, Gallia Academy; Hannah Robinson, Waverly; Jessica Camp, Miami Trace; Bailey Harris, New Lexington; Beckley Smith, McClain. Hallie Pinkerton, Unioto; Sarah Greenlee, Warren; Audrey Corzine, Chillicothe; Maddy Jenkins, Washington Court House; Laikyn Teasley, Fairfield Union; Jordan Banks, Jackson; Hailey Robinson, Waverly; Hailey Hott, Unioto; Hunter Copley, Gallia Academy; Ryelee Sipple, Gallia Academy; Sydney Campolo; Olivia Wolfe, Miami Trace; Kaylee Stevenson, McClain; Lexi Parsons, Logan Elm; Jocie Fisher, Unioto; Elianna Tuppercer, Athens; Sierra Somerville, River Valley; Riley Moberly, Hillsboro. Kailyn Sharp, Athens; Shalyn Reffitt, Vinton County; Alex Barnes, Gallia Academy; Airika Barr, River Valley; Elisabeth Williams, Warren; Melanie Clum, Sheridan; Lilly Cowman, Washington Court House; Kayla Forsythe, Fairfield Union; Abby Keaton, Circleville; Sydney Wickline, Circleville; Kirsten Blair, Waverly; Ashton Snider, Fairfield Union; Avery Grayson, Warren; Haley Patterson, Jackson; Kaylee Hauck, Miami Trace; Brookesanne Barnett, Vinton County; Kendall Pollard, McClain; Maddy Osborn, Washington Court House.